Dawn on Wednesday Dec. 25, 2013. Early risers will have an opportunity to see the moon move through the sky on Christmas Day and throughout the week. Dawn on Friday Dec. 27, 2013. Over the next few days, the moon will pass a series of bright cosmic markers. If you get up early on Christmas Day (Dec. 25), you will be greeted by a celestial present. The bright waning crescent moon will be just to the right of the planet Mars. 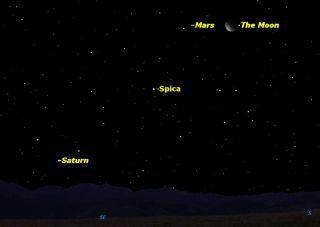 By the following morning, the moon will have moved so that it’s in between Mars and the bright star Spica. Observers in northern Europe and Asia will actually witness the moon passing in front of Spica in what is called a lunar occultation. On Friday morning (Dec. 26), skywatchers will see the moon past Spica, with a much narrower crescent as it gets ready to pass in front of the sun. Dawn on Sunday Dec. 29, 2013. Saturday morning finds the moon almost at Saturn. Observers in the Kerguelen Islands and Antarctica will see the moon pass in front of Saturn. Finally, on Sunday morning, the moon will be below Saturn and heading for the horizon and new moon on Jan. 1, 2014. Editor's note: If you take an amazing photo of the moon in its conjunctions or any other night sky photo you'd like to share for a possible story or image gallery, please contact SPACE.com managing editor Tariq Malik at spacephotos@space.com.